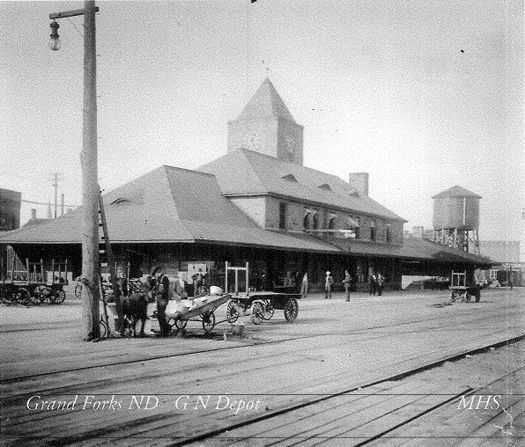 The Grand Forks Depot is the largest of the three Great Northern depots that Gilbert designed in 1891. Unlike the Willmar Depot design that features a two-story center block with one-story wings, the Grand Forks Depot is essentially a two-story building, featuring powerful stone walls with mitered corners, an expansive hip roof, and a Norman-influenced, central clock tower capped with a pyramidal roof. The design is not clearly derived from a single source, although it exhibits a Richardsonian influence. The building still exists, but the tower has been modified.